More medical tales from the hospital operating room in this week's Weird Tech round-up. First up, forget the Zune tattoo man , technology-inspired body mutilation has come on leaps and bounds since then. Rather than buying a phone with a bigger keypad, a "large" American man had his thumbs "surgically altered" to allow him to use his iPhone with greater accuracy, the North Denver News alleged earlier this week. The procedure - known, apparently, as "whittling" - involved a small incision being made into both his thumbs, before the digits were shaved down to the bone. Horrific, although undoubtedly made up. Believe it or not, the story could have been stranger. The operation could have been preformed with the help of GPS technology, which this week made the news for its increasing popularity as a surgical application . 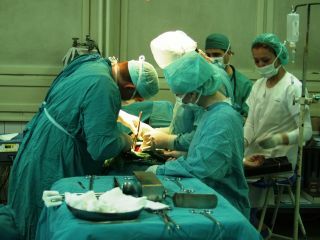 And the surgeon involved could have been a four-armed robot as well, had the operation taken place in Edmonton, Canada. Unusual shock tactics here. A new toilet-based computer game intended to help tackle drink-driving was tested in bars and clubs around Frankfurt this week. Playing on a weakness of all drinkers - their bladders - the Piss-Screen is a pressure-sensitive inlay for urinals that lets you play a computer game while you wee. Based on Need for Speed, players steer a car round a course by aiming left or right as necessary. It's all relatively entertaining, until the game terminates in a horrifying crash sequence followed by the message: "Too pissed to drive? Take a Taxi instead". In lighter news, in California the world's largest camera made it into the Guinness Book of Records on Monday after taking the largest photograph in the world. Made from an old aircraft hangar, the top of the camera stood a towering 44 foot off the ground. It took 10 days to expose the 31 by 111 foot picture. Now, don't give up the cool box yet, but the iDrink solar swimware line for men could be about to revolutionise summer outdoor drinking. So much better than the female Solar Bikini , the iDrink combines the best bits of a summer's day: the beach, good tunes and beer. Not only do the shorts charge your iPod while you lie in the sun, they also generate enough power to keep your beer cool as well. Truly inspired. Other, albeit slightly less-brilliant, gadgets we saw included the all-singing, all-cleaning concept showerhead MP3 player from Hae Lim, the inflatable-dress-that-turns-into-a-chair , and the brilliant Self Standing Umbrella . Beach-goers in Holland were joined by a giant, smiling Lego man on Tuesday. The eight-foot tall yellow figure was fished out the sea after being spotted bobbing around close to the beach. The toy was later placed in front of the drinks stand.